How did the Libyan rebels get formed and armed so quickly? The answer is the same as every previous rebel versus government war – by the CIA. 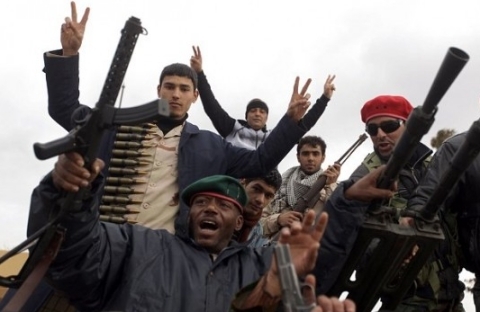 The Libyan rebels have been recruited, financed and armed by the United States through the CIA. 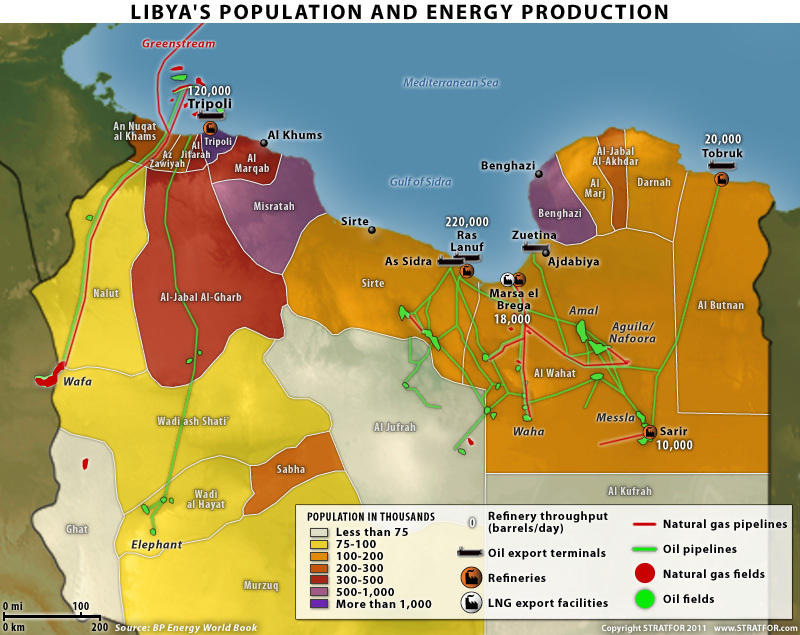 The CIA orders are to secure the Libyan oil installations before a US lead invasion, The Libyan rebels work for the US. Democracy isn’t the agenda in Libya, control of the oil is and the US is backing the rebels to covertly steal the financial future of the Libyan people. One only has to refer to the CIA’s own website to find proof that this civil war is no different than any other civil war in a country that the United States has a corporate interest in. So, on behalf of American business, and often with their help, the CIA mobilizes the opposition. First it identifies right-wing groups within the country (usually the military), and offers them a deal: “We’ll put you in power if you maintain a favorable business climate for us.” The Agency then hires, trains and works with them to overthrow the existing government (usually a democracy). It uses every trick in the book: propaganda, stuffed ballot boxes, purchased elections, extortion, blackmail, sexual intrigue, false stories about opponents in the local media, infiltration and disruption of opposing political parties, kidnapping, beating, torture, intimidation, economic sabotage, death squads and even assassination. These efforts culminate in a military coup, which installs a right-wing dictator. The CIA trains the dictator’s security apparatus to crack down on the traditional enemies of big business, using interrogation, torture and murder. The victims are said to be “communists,” but almost always they are just peasants, liberals, moderates, labor union leaders, political opponents and advocates of free speech and democracy. Widespread human rights abuses follow. The CIA justifies these actions as part of its war against communism. Today the CIA justifies their atrocities as part of the United States “War on Terror”. But most coups do not involve a communist threat nor a terrorist threat. Unlucky nations are targeted for a wide variety of reasons: not only threats to American business interests abroad, but also liberal or even moderate social reforms, political instability, the unwillingness of a leader to carry out Washington’s dictates. The ironic thing about all this intervention is that it frequently fails to achieve American objectives. Often the newly installed dictator grows comfortable with the security apparatus the CIA has built for him. He becomes an expert at running a police state. And because the dictator knows he cannot be overthrown, he becomes independent and defiant of Washington’s will. The CIA then finds it cannot overthrow him, because the police and military are under the dictator’s control, afraid to cooperate with American spies for fear of torture and execution. The only two options for the U.S at this point are impotence or war. Examples of this “boomerang effect” include the Shah of Iran, General Noriega, Hamid Karzai,Saddam Hussein, Hosni Mubarak, and Muammar Gaddafi. The boomerang effect also explains why the CIA has proven highly successful at overthrowing democracies, but a wretched failure at overthrowing dictatorships. The following time line should confirm that the CIA as we know it should be abolished. 1945 Operation PAPERCLIP – While other American agencies are hunting down Nazi war criminals for arrest, the U.S. intelligence community is smuggling them into America, unpunished, for their use against the Soviets. The most important of these is Reinhard Gehlen, Hitler’s master spy who had built up an intelligence network in the Soviet Union. With full U.S. blessing, he creates the “Gehlen Organization,” a band of refugee Nazi spies who reactivate their networks in Russia. These include SS intelligence officers Alfred Six and Emil Augsburg (who massacred Jews in the Holocaust), Klaus Barbie (the “Butcher of Lyon”), Otto von Bolschwing (the Holocaust mastermind who worked with Eichmann) and SS Colonel Otto Skorzeny (a personal friend of Hitler’s). The Gehlen Organization supplies the U.S. with its only intelligence on the Soviet Union for the next ten years, serving as a bridge between the abolishment of the OSS and the creation of the CIA. However, much of the “intelligence” the former Nazis provide is bogus. Gehlen inflates Soviet military capabilities at a time when Russia is still rebuilding its devastated society, in order to inflate his own importance to the Americans (who might otherwise punish him). In 1948, Gehlen almost convinces the Americans that war is imminent, and the West should make a preemptive strike. In the 50s he produces a fictitious “missile gap.” To make matters worse, the Russians have thoroughly penetrated the Gehlen Organization with double agents, undermining the very American security that Gehlen was supposed to protect. 1947 Greece — President Truman requests military aid to Greece to support right-wing forces fighting communist rebels. For the rest of the Cold War, Washington and the CIA will back notorious Greek leaders with deplorable human rights records. 1949 Radio Free Europe — The CIA creates its first major propaganda outlet, Radio Free Europe. Over the next several decades, its broadcasts are so blatantly false that for a time it is considered illegal to publish transcripts of them in the U.S.
Late 40s Operation MOCKINGBIRD — The CIA begins recruiting American news organizations and journalists to become spies and disseminators of propaganda. The effort is headed by Frank Wisner, Allan Dulles, Richard Helms and Philip Graham. Graham is publisher of The Washington Post, which becomes a major CIA player. Eventually, the CIA’s media assets will include ABC, NBC, CBS, Time, Newsweek, Associated Press, United Press International, Reuters, Hearst Newspapers, Scripps-Howard, Copley News Service, CNN and more. By the CIA’s own admission, at least 25 organizations and 400 journalists will become CIA assets. 1953 Iran – The CIA overthrows the democratically elected Mohammed Mossadegh in a military coup, after he threatened to nationalize British oil. The CIA replaces him with a dictator, the Shah of Iran, whose secret police, SAVAK, is as brutal as the Gestapo. 1954 Guatemala — CIA overthrows the democratically elected Jacob Arbenz in a military coup. Arbenz has threatened to nationalize the Rockefeller-owned United Fruit Company, in which CIA Director Allen Dulles also owns stock. Arbenz is replaced with a series of right-wing dictators whose bloodthirsty policies will kill over 100,000 Guatemalans in the next 40 years. 1954-1958 North Vietnam — CIA officer Edward Lansdale spends four years trying to overthrow the communist government of North Vietnam, using all the usual dirty tricks. The CIA also attempts to legitimize a tyrannical puppet regime in South Vietnam, headed by Ngo Dinh Diem. These efforts fail to win the hearts and minds of the South Vietnamese because the Diem government is opposed to true democracy, land reform and poverty reduction measures. The CIA’s continuing failure results in escalating American intervention, culminating in the Vietnam War. 1956 Hungary — Radio Free Europe incites Hungary to revolt by broadcasting Khruschev’s Secret Speech, in which he denounced Stalin. It also hints that American aid will help the Hungarians fight. This aid fails to materialize as Hungarians launch a doomed armed revolt, which only invites a major Soviet invasion. The conflict kills 7,000 Soviets and 30,000 Hungarians. 1957-1973 Laos — The CIA carries out approximately one coup per year trying to nullify Laos’ democratic elections. The problem is the Pathet Lao, a leftist group with enough popular support to be a member of any coalition government. In the late 50s, the CIA even creates an “Armee Clandestine” of Asian mercenaries to attack the Pathet Lao. After the CIA’s army suffers numerous defeats, the U.S. starts bombing, dropping more bombs on Laos than all the U.S. bombs dropped in World War II. A quarter of all Laotians will eventually become refugees, many living in caves. 1959 Haiti — The U.S. military helps “Papa Doc” Duvalier become dictator of Haiti. He creates his own private police force, the “Tonton Macoutes,” who terrorize the population with machetes. They will kill over 100,000 during the Duvalier family reign. The U.S. does not protest their dismal human rights record. 1961 The Bay of Pigs — The CIA sends 1,500 Cuban exiles to invade Castro’s Cuba. But “Operation Mongoose” fails, due to poor planning, security and backing. The planners had imagined that the invasion will spark a popular uprising against Castro -– which never happens. Kennedy refuses to provide air support. This is the CIA’s first public setback, causing President Kennedy to fire CIA Director Allen Dulles. This CIA failure and the firing of Dulles as CIA director gave the CIA motive to assassinate the president of thew United States on November 22, 1963. 1963 Dominican Republic — The CIA overthrows the democratically elected Juan Bosch in a military coup. The CIA installs a repressive, right-wing junta. United States – The CIA with the financial backing of th Federal Reserve Bankers assassinate John F Kennedy. CIA puppet Johnson becomes president. 1964 Brazil — A CIA-backed military coup overthrows the democratically elected government of Joao Goulart. The junta that replaces it will, in the next two decades, become one of the most bloodthirsty in history. General Castelo Branco will create Latin America’s first death squads, or bands of secret police who hunt down “communists” for torture, interrogation and murder. Often these “communists” are no more than Branco’s political opponents. Later it is revealed that the CIA trains the death squads. 1965 Indonesia — The CIA overthrows the democratically elected Sukarno with a military coup. The CIA has been trying to eliminate Sukarno since 1957, using everything from attempted assassination to sexual intrigue, for nothing more than his declaring neutrality in the Cold War. His successor, General Suharto, will massacre between 500,000 to 1 million civilians accused of being “communist.” The CIA supplies the names of countless suspects. 1966 The Ramparts Affair — The radical magazine Ramparts begins a series of unprecedented anti-CIA articles. Among their scoops: the CIA has paid the University of Michigan $25 million dollars to hire “professors” to train South Vietnamese students in covert police methods. MIT and other universities have received similar payments. Ramparts also reveals that the National Students’ Association is a CIA front. Students are sometimes recruited through blackmail and bribery, including draft deferments. 1968 Operation CHAOS — The CIA has been illegally spying on American citizens since 1959, but with Operation CHAOS, President Johnson dramatically boosts the effort. CIA agents go undercover as student radicals to spy on and disrupt campus organizations protesting the Vietnam War. They are searching for Russian instigators, which they never find. CHAOS will eventually spy on 7,000 individuals and 1,000 organizations. 1969 Uruguay — The notorious CIA torturer Dan Mitrione arrives in Uruguay, a country torn with political strife. Whereas right-wing forces previously used torture only as a last resort, Mitrione convinces them to use it as a routine, widespread practice. “The precise pain, in the precise place, in the precise amount, for the desired effect,” is his motto. The torture techniques he teaches to the death squads rival the Nazis’. He eventually becomes so feared that revolutionaries will kidnap and murder him a year later. 1970 Cambodia — The CIA overthrows Prince Sahounek, who is highly popular among Cambodians for keeping them out of the Vietnam War. He is replaced by CIA puppet Lon Nol, who immediately throws Cambodian troops into battle. This unpopular move strengthens once minor opposition parties like the Khmer Rouge, which achieves power in 1975 and massacres millions of its own people. 1971 Bolivia — After half a decade of CIA-inspired political turmoil, a CIA-backed military coup overthrows the leftist President Juan Torres. In the next two years, dictator Hugo Banzer will have over 2,000 political opponents arrested without trial, then tortured, raped and executed. Haiti — “Papa Doc” Duvalier dies, leaving his 19-year old son “Baby Doc” Duvalier the dictator of Haiti. His son continues his bloody reign with full support of the CIA. 1972 The Case-Zablocki Act — Congress passes an act requiring congressional review of executive agreements. In theory, this should make CIA operations more accountable. In fact, it is only marginally effective. 1973 Chile — The CIA overthrows and assassinates Salvador Allende, Latin America’s first democratically elected socialist leader. The problems begin when Allende nationalizes American-owned firms in Chile. ITT offers the CIA $1 million for a coup (reportedly refused). The CIA replaces Allende with General Augusto Pinochet, who will torture and murder thousands of his own countrymen in a crackdown on labor leaders and the political left. 1974 CHAOS exposed — Pulitzer prize winning journalist Seymour Hersh publishes a story about Operation CHAOS, the domestic surveillance and infiltration of anti-war and civil rights groups in the U.S. The story sparks national outrage. 1975 Australia — The CIA helps topple the democratically elected, left-leaning government of Prime Minister Edward Whitlam. The CIA does this by giving an ultimatum to its Governor-General, John Kerr. Kerr, a longtime CIA collaborator, exercises his constitutional right to dissolve the Whitlam government. The Governor-General is a largely ceremonial position appointed by the Queen; the Prime Minister is democratically elected. The use of this archaic and never-used law stuns the nation. Congress investigates CIA wrong-doing — Public outrage compels Congress to hold hearings on CIA crimes. Senator Frank Church heads the Senate investigation (“The Church Committee”), and Representative Otis Pike heads the House investigation. The investigations lead to a number of reforms intended to increase the CIA’s accountability to Congress, including the creation of a standing Senate committee on intelligence. However, the reforms prove ineffective, as the Iran/Contra scandal will show. It turns out the CIA can control, deal with or sidestep Congress with ease. 1979 Iran — The CIA fails to predict the fall of the Shah of Iran, a longtime CIA puppet, and the rise of Muslim fundamentalists who are furious at the CIA’s backing of SAVAK, the Shah’s bloodthirsty secret police. In revenge, the Muslims take 52 Americans hostage in the U.S. embassy in Tehran. 1980 El Salvador — The Archbishop of San Salvador, Oscar Romero, pleads with President Carter “Christian to Christian” to stop aiding the military government slaughtering his people. Carter refuses. Shortly afterwards, right-wing leader Roberto D’Aubuisson has Romero shot through the heart while saying Mass. The country soon dissolves into civil war, with the peasants in the hills fighting against the military government. The CIA and U.S. Armed Forces supply the government with overwhelming military and intelligence superiority. CIA-trained death squads roam the countryside, committing atrocities like that of El Mazote in 1982, where they massacre between 700 and 1000 men, women and children. By 1992, some 63,000 Salvadorans will be killed. 1981 Iran/Contra Begins — The CIA begins selling arms to Iran at high prices, using the profits to arm the Contras fighting the Sandinista government in Nicaragua. President Reagan vows that the Sandinistas will be “pressured” until “they say ‘uncle.’” The CIA’s Freedom Fighter’s Manual disbursed to the Contras includes instruction on economic sabotage, propaganda, extortion, bribery, blackmail, interrogation, torture, murder and political assassination. 1983 Honduras — The CIA gives Honduran military officers the Human Resource Exploitation Training Manual – 1983, which teaches how to torture people. Honduras’ notorious “Battalion 316? then uses these techniques, with the CIA’s full knowledge, on thousands of leftist dissidents. At least 184 are murdered. 1984 The Boland Amendment — The last of a series of Boland Amendments is passed. These amendments have reduced CIA aid to the Contras; the last one cuts it off completely. However, CIA Director William Casey is already prepared to “hand off” the operation to Colonel Oliver North, who illegally continues supplying the Contras through the CIA’s informal, secret, and self-financing network. This includes “humanitarian aid” donated by Adolph Coors and William Simon, and military aid funded by Iranian arms sales. 1986 Eugene Hasenfus — Nicaragua shoots down a C-123 transport plane carrying military supplies to the Contras. The lone survivor, Eugene Hasenfus, turns out to be a CIA employee, as are the two dead pilots. The airplane belongs to Southern Air Transport, a CIA front. The incident makes a mockery of President Reagan’s claims that the CIA is not illegally arming the Contras. 1989 Panama — The U.S. invades Panama to overthrow a dictator of its own making, General Manuel Noriega. Noriega has been on the CIA’s payroll since 1966, and has been transporting drugs with the CIA’s knowledge since 1972. By the late 80s, Noriega’s growing independence and intransigence have angered Washington… so out he goes. 1990 Haiti — Competing against 10 comparatively wealthy candidates, Catholic priest Jean-Bertrand Aristide captures 68 percent of the vote. After only eight months in power, however, the CIA-backed military deposes him. More military dictators brutalize the country, as thousands of Haitian refugees escape the turmoil in barely seaworthy boats. As popular opinion calls for Aristide’s return, the CIA begins a disinformation campaign painting the courageous priest as mentally unstable. 1991 The Gulf War — The U.S. liberates Kuwait from Iraq. But Iraq’s dictator, Saddam Hussein, is another creature of the CIA. With U.S. encouragement, Hussein invaded Iran in 1980. During this costly eight-year war, the CIA built up Hussein’s forces with sophisticated arms, intelligence, training and financial backing. This cemented Hussein’s power at home, allowing him to crush the many internal rebellions that erupted from time to time, sometimes with poison gas – supplied by the United States through special envoy Donald Rumsfeld to Iraq. It also gave him all the military might he needed to conduct further adventurism — in Kuwait, for example. 1992 Economic Espionage — In the years following the end of the Cold War, the CIA is increasingly used for economic espionage. This involves stealing the technological secrets of competing foreign companies and giving them to American ones. Given the CIA’s clear preference for dirty tricks over mere information gathering, the possibility of serious criminal behavior is very great indeed. 1993 Haiti — The chaos in Haiti grows so bad that President Clinton orders the removal of the US backed Haitian military dictator, Raoul Cedras, and threatens a U.S. invasion. The U.S. occupiers do not arrest Haiti’s military leaders for crimes against humanity, but instead ensure their safety and rich retirements. Aristide is returned to power only after being forced to accept an agenda favorable to the country’s ruling class. 2001 – United States — The CIA begins planning for attacks on US soil after the Afghanistan ruling party, the Taliban, give the Trans-Afghan Natural Gas pipeline project to Argentina oil company Bridas Corporation. US Unicol, petitioned the US government to use the US military to expedite a regime change and install a US friendly leader. September 11, 2001 CIA aircraft, repainted to look like US commercial airlines are flown by remote control in the World Trade Center Towers and a CIA owned unmanned aerial drone into the Pentagon. Not one but 3 World Trade Center Towers are “demolished using shape charges and small underground tactical nuke explosions. Immediately the US government takes control of all media reporting to cover up the CIA crimes against the United States. The CIA gave the US government an excuse to launch the first of many pre-emptive wars against Afghanistan, Iraq and Pakistan. 2011 – Libya — CIA backed rebels attempt to overthrow US backed Gaddafi. As with the Afghanistan and Iraq wars the motive is to take control of US oil interests. CIA military transport planes use Saudi airfields to launch airlifts to drop mercenaries and weaponry to CIA controlled rebels. US warships with thousands of Marines on board wait offshore until the CIA backed rebels (mostly made up of foreign mercenaries) have complete control over the Libyan oil installations. Libyan rebels took back a key oil town and pushed westward Sunday toward the capital, seizing momentum from the international airstrikes that tipped the balance away from Moammar Gadhafi’s military. Brega, a main oil export terminal in eastern Libya, fell after a skirmish late Saturday and rebel forces moved swiftly west, seizing the tiny desert town of Al-Egila _ a collection of houses and a gas station _ on their way to the massive oil refining complex of Ras Lanouf.